The themes of the holiday season, being appreciation in Thanksgiving and joy in celebration of the first Christmas, coincide with weather encouraging long, cozy nights indoors. Such times seem tailor made for books generally and edifying reads in particular, and as an author I hope all of you are indulging yourselves that way. My November absorption was an overdue study of the 1952 classic by the renowned C.S. Lewis, titled in his devout understatement Mere Christianity. In this work, the masterful Lewis provides wonderful and insightful commentary on the basic tenets of Christian faith held in commonality by those who believe. It is rightly considered an essential read for all of us who realize ourselves to be between Here and There. Substantive enough that it deserves to be taken on one chapter at a time, with each being followed by contemplation in turn, Lewis assures, convicts, and comforts. Personally, I perceived evident hints of his formative influence on another convincing apologist, Josh McDowell, who like Lewis also started from a base of skepticism. Those recognizable precepts made clear that this book had influenced my own perspective years previous to my finally engaging the thing. In a sense, C.S. Lewis is another of my literary fathers, and with me, through McDowell, helped produce my catalog of novels. Expressing in fiction the seeds of faith I’ve been allowed to present through the lives of my characters Jon, Sean, and Boone is therefore partially their legacy as well. Such is the work of the Spirit. Like Lewis, my character Jon Anthony sought to emphasize commonalities of faith rather than spur conflict in outlining divergence. Their respective efforts similarly proceeded from a peaceful nature, the bestowment of which is a core value and benefit of embracing Christianity. Such descends from the essential motivation of our Creator, which is love. Love was born in the mind of God, who then realized his desire for servants and souls with whom He could share the best of all emotions. Everything else followed. Love, necessarily a choice, has a dependency on free will, the unfortunate application of which gives rise to sin rather than harmony. All things nurturing and charitable proceed from it, and we rightly celebrate those each holiday season and whenever else the proper mindset allows. 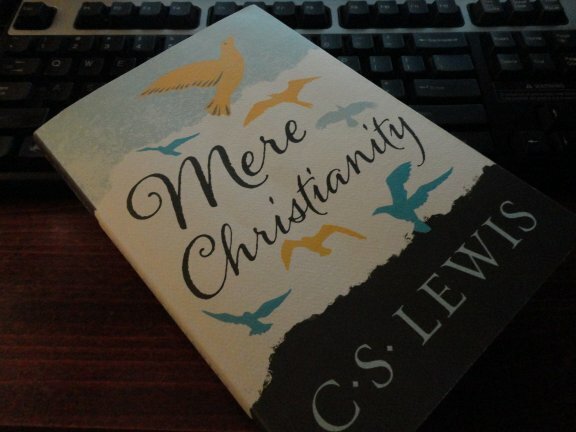 Mere Christianity is eminently worthwhile. Regardless of your state of belief you should read it for yourself as a life task and initiative of spiritual edification. A personal side benefit of digesting the work was an insight as to the nature of truth. Actualities, you see, and particularly those from which Lewis constructs his arguments, are and were always here. Truth, as does the existence of a personal Creator, endures in an essential state of being. Those exist independent of discovery, acceptance, promulgation, or consensus. Truths of the physical plane discovered and undiscovered through science, for instance, are in effect independent of anyone being aware of them. In that way, physical and spiritual laws share an essential commonality. It is in their embrace that we grow our perspective and build a more useful outlook beyond the data set from which we previously proceeded. It is this aspect of useful truth inviting embrace that led to the Great Commission, and the efforts of Lewis, and afterward McDowell, and then myself. Everything true directs toward sure knowledge of the nature of its Craftsman: the motivating love of the Father, the accommodating forgiveness of the Son, and the unrelenting outreach of the Spirit through whom we commune with Him from this world we know. As is so eloquently expressed in Mere Christianity, what He does has the goal of successfully delivering us to our Creator. Should one understand nothing else of His Will, that would be enough of a beginning to launch a life lived as it should be. Remember one precept, descending from the apostle Paul’s commendation to the Bereans, who searched Scripture nightly to confirm the things he told them were so: truth fears nothing from inspection. So it is each holiday season, as in the dawn of another day: a fresh chance to begin appears again. Like truth, the opportunity is always there, waiting to be picked up, held dear, and carried forward. You have our wishes for a Merry Christmas and the best of New Years from everyone here at Single Candle Press. Just a reminder that all three of my series—Jon’s Trilogy, Sean’s File, and Boone’s File—now have a free gateway title available through links on the sidebar if one uses an e-reader. Those collections of novels I have connived to support and enhance each other, as each takes place in its own decade of the same literary universe. Reading material in any form, though, makes a great gift, one with the potential to move forward from then on with the mind it encounters. Should you think enough of my writing to pass it on to another, thank you in advance!